February 6, 2019. By Cassy Aoyagi: Beauty is important. Not only is LA’s authentic beauty critical to our ecological resilience, it is a game changer when it comes to our health, wellbeing and social resilience. To state the obvious, those benefits are not easily, let alone equally, accessible to Angelenos. Thanks to Thomas Safran and Associates, we’ve had the honor of bringing nature a bit closer to seniors previously without homes in Willowbrook. KTLA’s Gale Anderson interviewed Thomas Safran and Associates’ Jordan Pynes in the residents’ garden of the 150 unit apartment building about the vision for the project. 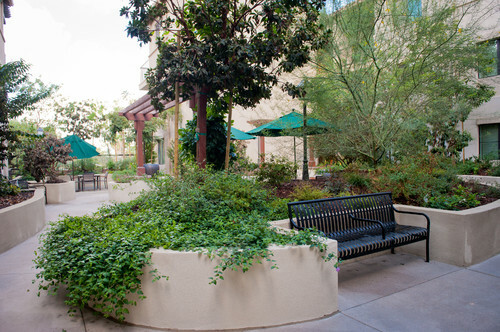 In designing the Gateway’s garden spaces, FormLA Lead Designer Isara Ongwiseth aimed to create vital and verdant spaces for residents to relax and enjoy, as well as spaces that facilitate gathering and connection. 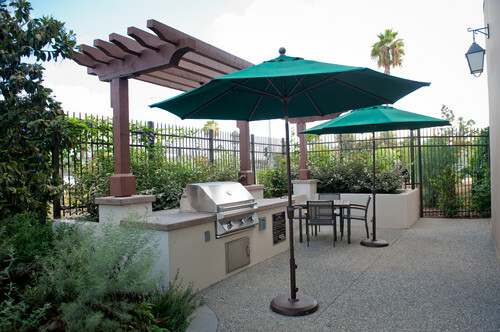 Within the ground-level resident garden, there is a dining patio with deep shade from a native oak tree. For cool mornings and nights, the area is warmed by a fire pit. 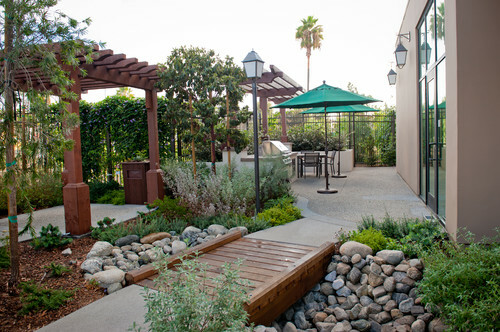 From the dining patio, a bridge over a rambling bioswale leads to a beautifully appointed outdoor kitchen, a trail leading to hedges of edible Catalina Cherry, space for a vegetable garden, and additional seating under a vine-wrapped pergola. Time in such spaces has been shown to decrease stress and increase concentration, even mitigating the symptoms of PTSD and ADHD. At a minimum, we hope residents’ feel peace and joy in the space! Views of naturalistic spaces are also known to speed physical healing. 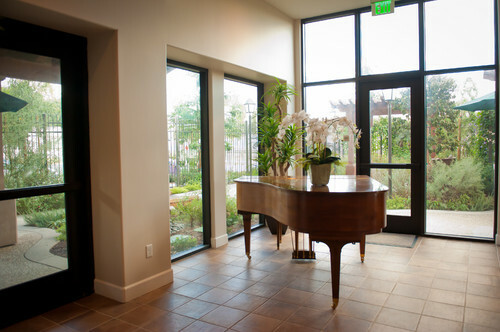 For this reason, great care was taken to ensure the view of the garden from the residents’ great room showcased as much beauty as possible. From the interior, residents can enjoy the burbling of a waterfall, the enchanting flames of the fire pit and abundant greenery. Architects so prioritized access to the healing impacts of greenery, they included space for mezzanine-level gardens, full of trees and native foliage. While the spaces featured above are for residents, natural spaces have also been added to the building’s exterior. This once vacant lot now contains broad sidewalks on 3 sides, each shaded by trees, including flowering Palo Verde and Marina Strawberry trees that predictably delight passersby. It took unusual foresight and vision for Thomas Safran and Associates to save a substantial portion of the property for greenery and nature. 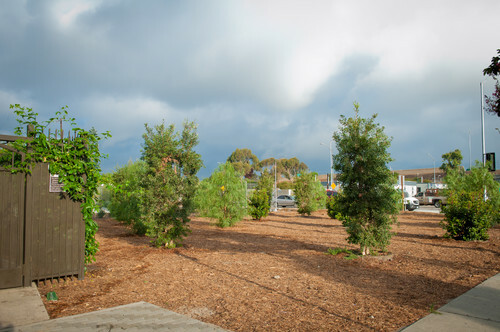 In addition to reserving space for nature onsite, an adjacent lot was leased and populated with trees. This addition dramatically shifts the relationship of the property to the adjacent 110 freeway and Rosa Parks Metro Station. 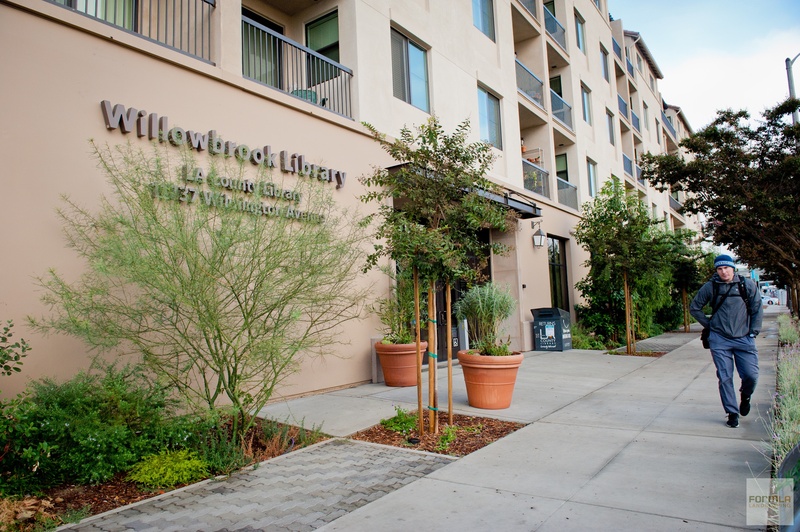 It adds the peace that comes with beauty to the experience of arriving in Willowbrook, a gift to the full community as well as to Gateway residents. The opportunity to expand Angeleno’s access to nature means the world to us, never more so than when we get to hear what it means to those new to the experience.